The summit of Ben Alder is a gentle rise on an broad plateau close to the precipitous cliffs on its E flank overlooking Beallach Beithe. The ground initially slopes gently from the summit in all other directions, but the N flank of Ben Alder is also steep and craggy. The most common route of ascent is the NE ridge and involves a scramble up the more northerly shoulder of Coire na Lethchois. To the S there are the steep slopes of Coire Chomhlain, but the SE ridge gives easy access to Beallach Breabag which separates Ben Alder from Beinn Bheoil. To the W easy slopes lead down to Meall an t-Slugain and to the path through Beallach Dubh. Ben Alder from Culra Bothy on a wonderful morning 9th September 2006. Ben Alder from Ben Chonzie, with Carn Gorm (Glen Lyon) on the left; 3rd April 2007. The summary information of one or more ascent routes that include Ben Alder. 1 1819 m 46.70 km 12.5 hrs Ben Alder and Beinn Bheoil This long route (with some scrambling) is more of an expedition. If you cycle to Loch Pattack the remaining route is 7h, 22km, ascent 917m which can be completed on a long summer day. Otherwise take a tent. 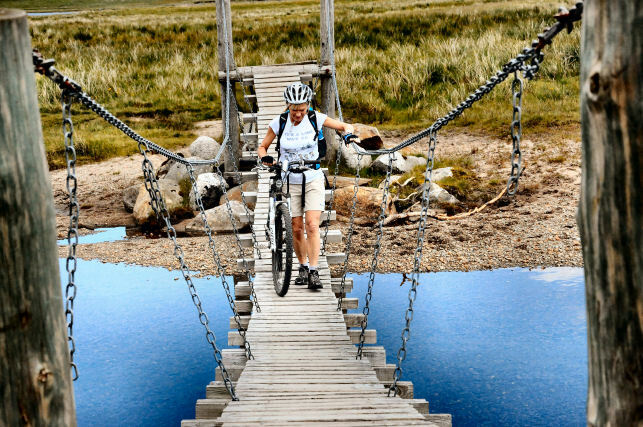 VS crossing the swing bridge just below Culra Bothy. 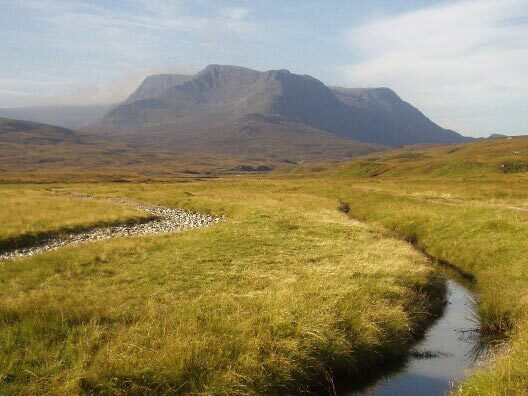 Post a few words about Ben Alder or read what others have had to say. I tried the cycle route from Gallovie but found it difficult with a tent etc. Had to remove panniers for the high stile and the swing bridge. Also there are a number of sandy streches that I could not cycle on the inward journey but just managed some on the return. Probably better for younger, fitter and more proficient mountain bikers. The Dalwhinnie route has ben resurfaced from above Ben Alder Lodge to the hay feeder. Overall I think this is the better route altghough, if you are travelling from the west you will save road miles via Gallovie. If cycling in consider taking the track from the turn off for Galiovie farm on the A86 Laggan road. Parking available at Strathmashie 1km or 2km before the turn off. It is longer than the track from Dalwhinnie but apart from a couple of short steep bits and a boggy section just before Loch Pattack, the gradient is fairly gentle and it gives easier cycling than the track from Dalwhinnie and is scenically more interesting. I did these two from Moy, walked in over Creag Pitrech and nirghbour, stayed at culra, ben alder and ben bhieol the next day, another bothy stop then a quick dash out again over Beinn a' Clachair- which was surprisly easy, decent path all the way up. Could easily be cut down to a one night stop though would be quite task. 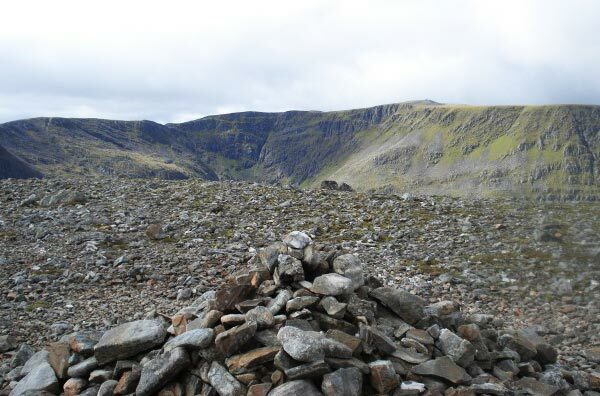 The complete round of all 6 Munros here is possible after an overnight in Culra...its a long day with a drop down below the Bealach Dubh and then steep climb back up to the Ben Alder plateau. Care should be taken in cloud as you follow the crags south then south east to the terminus of Ben Alder above Bealach Breabag. 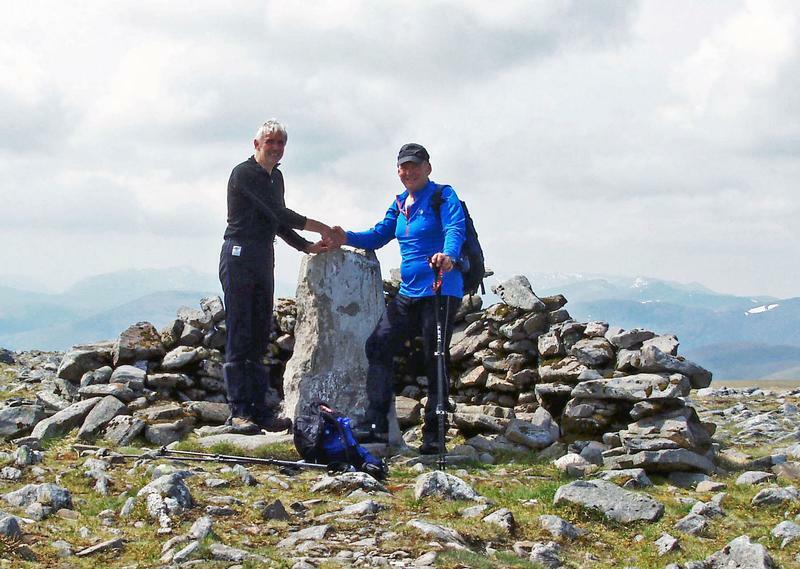 At the terminus the path peters out - head west then south down easy grassy slopes to reach the bealach.